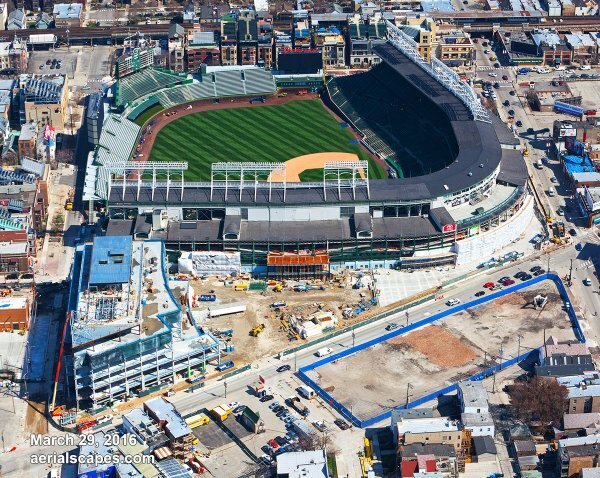 For decades, the phrase “beautiful Wrigley Field” didn’t fit the ballpark’s exterior, which was covered in gray concrete panels that could have been lifted from a 1960s parking garage. The ballpark only became beautiful when fans entered the seating bowl and the emerald green field and ivy-covered outfield walls burst on them, like Eden redux. But when the Cub faithful return to their bittersweet shrine for Monday’s opening night, they will witness something new — or, rather, something old: a Wrigley Field whose exterior is being restored to the way it looked in the 1930s, complete with ornamental grill work topped by elegant sunburst patterns.